Time Warner, Fox or Disney: Who rules Big Media? 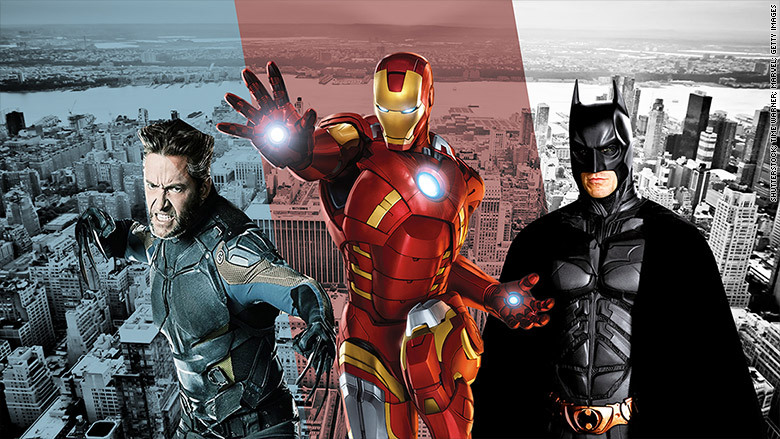 Fox may have Wolverine and the X-Men and Time Warner has Batman. But Iron Man and the rest of Disney's Avengers rule the box office -- and Wall Street. It's been 9 months since Time Warner said 'Get Lost' to Rupert Murdoch -- and the fortunes of the two companies have flipped since then. 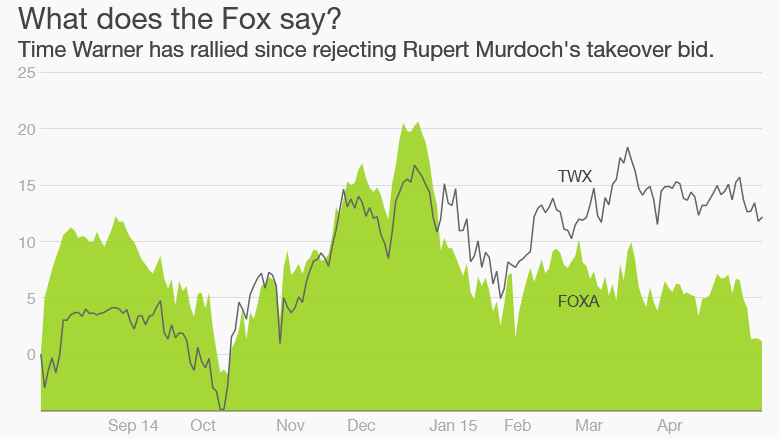 Time Warner's stock has gained nearly 15% since last August, and Fox's shares are mostly flat. And if you go back to the day before Fox made its offer for Time Warner public in mid-July, Time Warner shares are up almost 20% while Fox's are down 6%. The market value of Time Warner even edged ahead of Fox's (FOXA) last week after Fox's lackluster quarterly report. That's not what analysts were expecting. When Murdoch gave up on his $80 billion bid, Time Warner (TWX) shares sank, and analysts said Time Warner had better move quickly to justify its rejection of the deal. So what's next for the two big media firms? Some disclosures: Time Warner owns CNNMoney, and this reporter owns shares of Time Warner in his company's 401(k) plan. Fox's top priority will be addressing sluggish ratings in its broadcast business. The Fox network has only two legitimate primetime hits -- "Empire" and "Gotham." The latter, ironically enough, is based on a comic book franchise owned by Time Warner's DC Comics unit and produced by Warner Bros.
"Outside of 'Empire' and 'Gotham,' the ratings are not there," said Martin Pyykkonen, a media analyst with Rosenblatt Securities. "The broadcast division is a big part of their problems." Bank added that some investors may be worried too much about the primetime schedule and are ignoring sports, which brings in a huge amount of ad dollars. And the cable side of the business -- especially the Fox News channel -- is still doing reasonably well. Time Warner is also enjoying solid growth in cable. The Turner unit, which includes CNN, TNT and TBS, reported an operating profit increase of 26% from a year ago in the first quarter. Nonetheless, analysts said Time Warner can't rest on its laurels yet. Bank said there still may be a need for Time Warner (and Fox) to consider making acquisitions so they can control more content. That's one way to have more leverage when negotiating deals with the big cable and satellite companies. What's more, AT&T's (T) pending acquisition of DirecTV (DTV) is expected to get regulatory approval. Bank added that bulking up in programming is also a way for traditional media giants to stand out in the new digital world where companies like Apple (AAPL), Amazon (AMZN) and Netflix (NFLX) are becoming more powerful. Spokespeople from Fox and Time Warner did not comment when asked about possible acquisitions. Finally, it's worth noting that among Big Media, Comcast is near an all-time high and is worth a lot more than both Time Warner and Fox. The cable company also owns NBCUniversal. And Disney (DIS) is on an epic hot streak. Analysts and investors continue to love Disney because it's done a great job of diversifying its revenue base beyond advertising at ESPN and ABC. It has the most envied portfolio of content in the industry: Marvel and the Avengers. The Star Wars franchise -- and potentially an Indiana Jones reboot -- from Lucasfilm. Pixar. Plus: In addition to all its hit movies, Disney is also enjoying solid growth in its theme park and consumer products business. Take a look at what kids in elementary school are wearing. You'll see a lot of Elsa, Anna, Captain America and Darth Vader t-shirts. Disney shares have outperformed both Fox and Time Warner over the past few years. It is trading near an all-time high. And its market value is easily worth more than Time Warner's and Fox's ... combined.